What are the main mechanisms of homeostasis? Human body include mechanisms that help regulate the body, this includes organs, glands, tissues and cells. The adjusting of these enables the body to constantly be in a steady state. The main mechanisms of homeostasis are body temperature, body fluid composition, blood sugar, gas concentrations, and blood pressure. Pressure by which the blood is pumped around the body is controlled by a homeostatic mechanism. 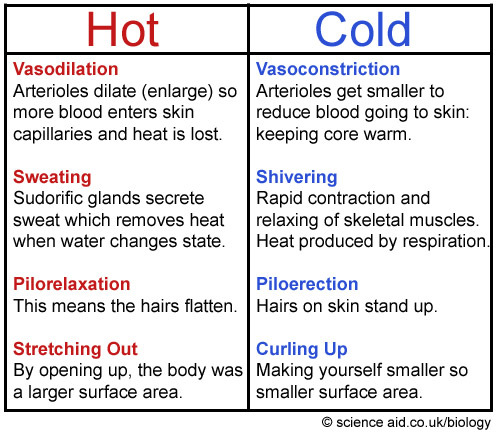 maintain the body's body temperature. The cells in the body require oxygen, but also removing all carbon dioxide as it is a waste product, so that sufficient energy can be produced. this is needed to be regulated and is controlled by the homeostatic mechanism that controls breathing. some control is over this function unlike other processes that there is none. the intercoastal muscles, the lungs and diaphram move air in and out of the lungs. the muscles are controlled by nerve impulses that are sent to the medulla oblongata from the respitory system. Blood sugar (explained on a different page), click here to go too it.